Joy to the world: here’s an elegant but easy holiday cocktail that you can mix up by the batch as your signature party cocktail. 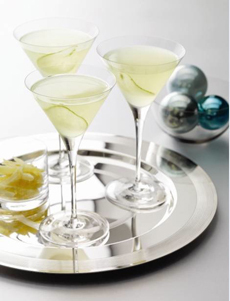 Grey Goose has made entertaining easier with this simple yet exquisite Ginger Joy Cocktail. It’s made with just a few ingredients, is big on holiday flavor, pairing two seasonal favorites, ginger liqueur and pear-flavored vodka. Stock up on the following ingredients and serve your guests a taste of the holidays! We use Grey Goose La Poire pear-flavored vodka and Domaine de Canton ginger liqueur. You’ll love Domaine de Canton ginger liqueur as much as you love the Grey Goose, and the gorgeous bottle makes it a terrific gift. In fact, if you need a gift, bring a bottle of each along with this recipe! *We love snacking on crystallized ginger. In addition to garnishing—on desserts as well as cocktails—it’s delicious in hot tea. Garnish with pear and/or ginger, as desired. 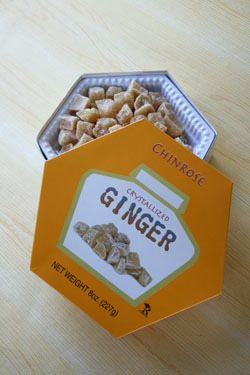 One of the best crystallized gingers comes from Chinrose. It’s certified kosher and can be found at retailers nationwide and online. Photo by Hannah Kaminsky | THE NIBBLE.